Curt Leskanic, by the numbers: It's clear from the above photo that Curt Leskanic was a cybernetic organism, serial number 371426300, that was sent back in time to wallow in mediocrity before winning Game 4 of the 2004 ALCS. But what does that number signify? Let's break it down. 371: This identifies the manufacturing plant where the cyborg was created, located underground in sub-Saharan Africa, the only place still safe and warm enough to live once the asteroid people find our planet. This is likely the same complex that produced fellow athletic cyborg Matt Riley. 42: The meaning of life, duh. 63: The half-life of the radioactive material powering this man-machine hybrid. Either that, or the rating, out of 10, of the thing's cheekbones. Grrrrowr! 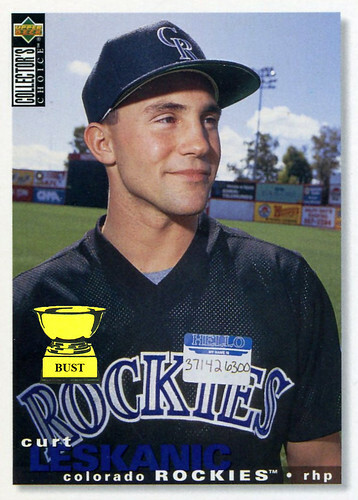 00: The combined value of all baseball cards that Leskanic would appear on. Hey, those future dudes really knew what they were talking about!